Bishop Vesey spent a fortune on improvements to Sutton Coldfield, including paving the streets of the town at a cost of £40.3s.8d. The streets paved were High Street, Coleshill Street and Mill Street, the weekly market being held at the junction of these streets. The work was done in about 1530, and the authorities tried to keep the streets looking smart - in 1552 everyone was ordered “to pick up and carry away their straw and rubbish out of the high street of Sutton Town and scour and clean that street weekly” and in 1598 “it is ordered that all inhabitants within the town of Great Sutton shall clean the street before their doorway from any dung-heaps and that they repair their pavement”. “Sutton, which is allowed to be one of the prettiest and neatest towns of its size in the kingdom, is also the cleanest, being handsomely paved”, according to a letter sent to the editor of the London Evening Post in 1762. But the paving must have been worn out thirty years later, when the Warden and Society spent £350 on paving the streets of Sutton with cobble stones. The Warden and Society also put Lichfield Road and Tamworth Road under trustees with toll gates at the town boundary - the toll house at Colletts Brook on Tamworth Road is still standing, though now derelict. “I remember when the roads to Walsall were impassable, and to get to Coleshill we had to go a round of many miles” - so said Vincent Holbeche in 1862, mud and flood water being the main problems. Old names for local lanes bear this out - there was Foulslough Lane, and Riland Road used to be Slash Lane. In the sixteenth century the fords in Tamworth Road and Wylde Green Road were sometimes hard to cross, and the court ordered the local landowners to maintain the footbridges at both places. At the ford in Wylde Green Road, named Schemeford, the roadway was very wide, giving travellers a choice of where to cross, - so wide that there was space at the side for Bishop Vesey to build a stone house there in the 1520s. 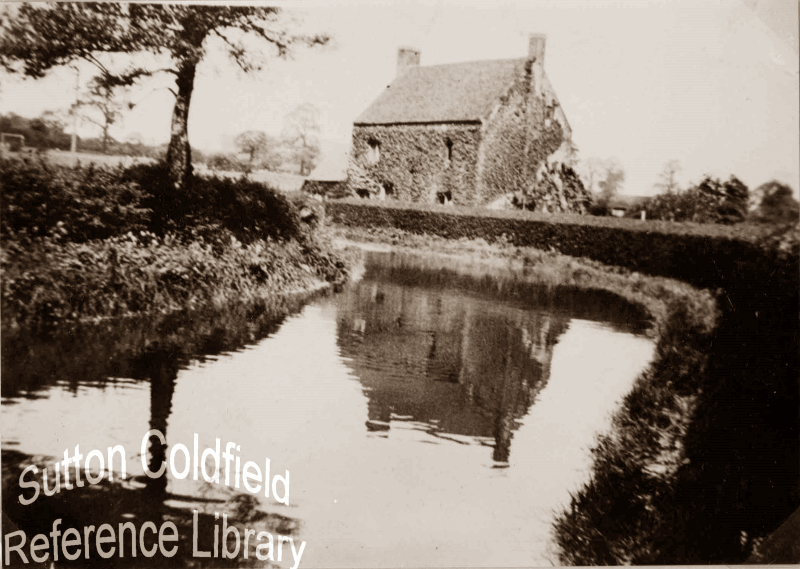 If travellers got into difficulties crossing the ford, the nearby cottage must have been a welcome refuge, and the cottager’s assistance a welcome help - for many years the stone house was known as The Fordkeepers Cottage. A flood in Wylde Green Road next to the stone house over 100 years ago (historic photo courtesy Sutton Reference Library).